i’ve been eating this soup like crazy this last week with some crusty bread with garlic butter. so good! the flavors of the carrots, ginger, and caramelized onions together is just amazing! try it! you’ll like it. 1. for caramelized onions, in a large skillet heat oil over medium heat. add sliced onion, sugar, and pepper; reduce heat to low and cook, covered, for 30 minutes, stirring twice. add ginger. cook, uncovered, 20 to 30 minutes more or until onion is golden brown, stirring occasionally. divide in half. 2. meanwhile, peel carrots and sweet potato and cut in 1-inch pieces. in large saucepan or dutch oven combine broth, carrots, and sweet potato. bring to boiling; reduce heat. simmer, covered, 40 minutes or until vegetables are very tender. add half of the caramelized onions. 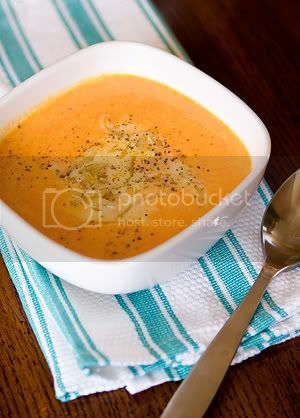 puree until nearly smooth with handheld blender or process 2 cups at a time in a food processor. add cream; heat through. season to taste with salt and ground black pepper. top with remaining caramelized onions. makes 12 (3/4-cup) side-dish servings. **caramelizing onions bring out their wonderful sweetness. and, no wonder, because you are actually turning the sugars within the onion to caramel – hence the name. caramelizing onions is just cooking them so they brown deeply. it is very easy to do and results in cooked onions with a dark, sweet, browned flavor. here are some easy steps to caramelize onions. 1. thinly slice 3 cups of onions. in a large skillet heat 2 tbsps cooking oil over medium heat. after oil is heated. add sliced onions, 2 tbsps sugar, and 1/8 tsp freshly ground pepper. reduce heat to low and cook, covered, for 30 minutes, stirring twice. 2. remove lid, and continue to cook uncovered for 20 to 30 minutes until desired color is reached. anywhere from light tan to golden to deep brown. do not cook past a mahogany color because the onions will be in danger of burning at that point. transfer to a cool plate so the cooking process stops. *serve over soups, with hamburgers, on pizza, omelette’s, you name it. This sounds quiet interesting! I don’t believe I’ve ever tried a soup with blended carrots…I may try this one soon. BTW, I am hosting a giveaway this week to celebrate my 1st blog birthday. Come by and enter! Making this right now, will send you feedback tomorrow as this is for my lunch tomorrow. Can't wait 🙂 Thanks!